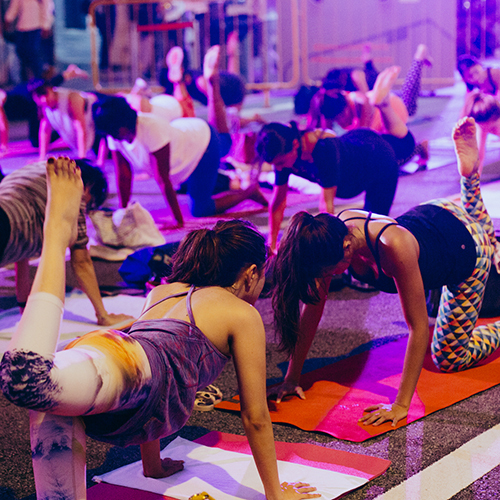 Exude poise and strength as we pulse to a chromatic beat at the Light To Night festival with Upside Motion's signature Xtend Barre session. Leave the classic black activewear at home and let's create a rainbow tapestry by turning up in your colourful ensemble! 1) New to Upside Motion? Sign up here! 2) Download Upside Motion App or visit our Class Schedules page. 3) Select City Hall studio location, and book yourself in "Xtend The Night at Asian Civilisations Museum" class on the 26 January 2018! First come first served, so secure your spot asap! A power workout tagged as the hottest Hollywood weight loss regime that combines fast-paced cardio with muscle training, think of it as Pilates-meets-ballet, given the seal of approval by celebs such as Margot Robbie and Jennifer Hawkins. Xtend Barre enthusiasts can look forward to earning the flexibility, strength and muscle tone of a ballerina, without having the need for any dance background. It's great for: ladies and gents who've ever fancied themselves in Natalie Portman's ballet slippers alà Black Swan, those who love to work up a fine sweat without the gasping breaths, and even seasoned fitness junkies looking for a new fusion workout to try. Also ideal for the busy workaholic, with the studio conveniently located in the CBD district for a quick lunchtime fitness fix. movement. Non-slip socks, studio wraps or ballerina shoes are recommended when attending Xtend Barre classes, but not required for the event. Please proceed to register at Upside Motion booth at ACM main lobby before joining the class. The class will be conducted at Asian Civilisations Museum's River Front, or River Room on Level 2 in case of rain.